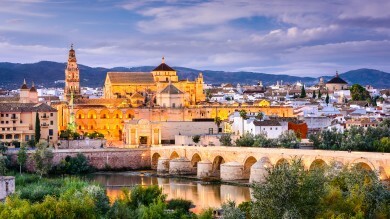 Home › Europe Tours › Spain Tours › Spain Travel Guide › La Sagrada Familia Tour: Is It Worth It? 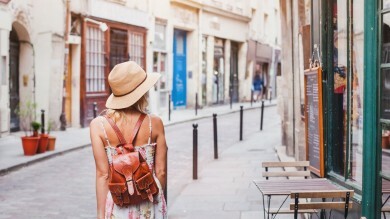 Visiting Barcelona can be a life altering travel experience. It is a city where creative expression comes alive in every aspect of day-to-day existence. 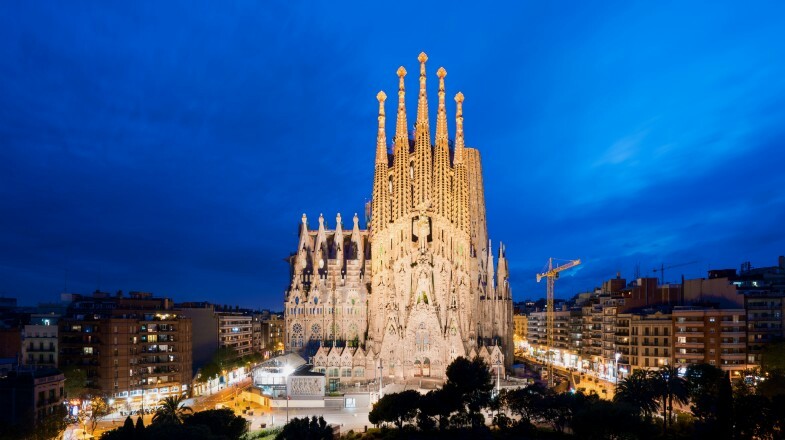 From canvas to cuisine and from fashion to furniture, every facet of Catalonian culture is a celebration of life, and Sagrada Familia is the epitome of this grand existential gala. The Basílica i Temple Expiatori de la Sagrada Família (meaning Basilica and Expiatory Church of the Holy Family), otherwise popularly known as La Sagrada Familia is Barcelona's most famous tourist site, attracting millions of visitors each year. It is Catalan architect Antoni Gaudi's magnum opus and the culmination of his life's work. Adding to the allure and mystery of La Sagrada Familia tour is the fact that the building remains unfinished despite the architect's having devoted more than 40 years of his life to the project. The timeline (almost 150 years) has been compared to that of the Great Pyramid of Giza (20 years) and the Great Wall of China (200 years). 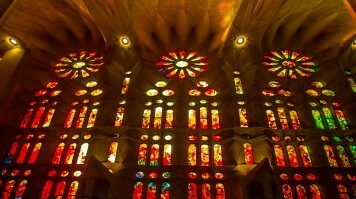 The projected deadline for completion of the Basilica is 2026, the centenary of Gaudi's passing. Ticket price: Between USD 19 and USD 36*. La Sagrada Familia tours cost a bit more than the ticket price but are often well worth the extra fee. Tours are packed with added value and groups usually zip past the long queues. Best time to visit: September to October is a good time to visit, along with March and May. With lesser tourist influx, the lines are thinner and it is still warm enough for a good holiday. Visit duration: Minimum 1 hour. But allow 2 to 3 hours for a thorough experience. Much of Gaudi's original drawings and models were destroyed by his detractors when his workshop was burned down in 1936. This led to a large-scale effort to curate as much of his work as possible. Learn about the fascinating history of Sagrada Familia by visiting the museum inside the basilica where you can see drawings and restored plaster models. The Three Facades, two of which are complete, are sculpted murals each containing a different facet of Christian theology. The facades contain some of Gaudi's most detailed work. The towers of the Nativity and Passion façade can be ascended through a combination of lifts and spiral staircases offering magnificent views of the city and a close-up peek at the ongoing construction. The 400-step spiral staircase, meant to resemble a seashell, is an architectural marvel and an iconic Sagrada Familia image. It is usually used on the descent after visiting one of the towers and is a brilliant photo opportunity. Nature is as a repetitive aesthetic theme at Sagrada Familia. Look for all the ways in-which Gaudi draws inspiration from the natural world. Spot a leaf patterned green door at the entrance, take note of the tree-like columns and windows which constitute the interior ceiling and the plaster fruit baskets used as spire tops. Tickets can be booked online or bought on-site. Getting tickets on-site can mean waiting hours in line as queues tend to be really long. Tickets for both entry to the basilica and a visit to the towers can be pre-booked. If booking tickets online, bear in mind that entry times are strictly controlled. It is therefore important to space out your entry and tower visit allowing enough time to appreciate both experiences. While it is better to book tickets online, booking a tour is by far the preferred choice as it allows you to fast-track entrance to the site and discover the many mysteries about Gaudi, his life and career. Arrive early and walk around the exterior enjoying the sculptures which make up the various Facades. The Nativity Façade was completed personally by Gaudi, the Passion and Glory Façades were completed later, but are just as interesting and beautiful to see. Once inside, begin by appreciating the beautiful interior columns and nave. Explore the cavernous main hall taking in all the beautiful details before visiting the museum. The Facades can be appreciated from the exterior as well as the interior. Sagrada Familia currently has eight towers. When the building is complete, there will be eighteen towers, twelve devoted to the twelve apostles, four representing the evangelists, one to the Virgin Mary and the highest and final one to Jesus Christ. We recommend ascending the tower of the Nativity Façade. There is a little bridge between the two towers where you can pause to admire some of the details of Gaudi's work. The added benefit of taking a tower tour is the spectacular views of Barcelona from the top. There are four chapels on the underground level. Visit Gaudi's tomb, in the chapel dedicated to El Carmen Virgin. The Chapel of the Eucharist, in the ambulatory is open for prayer and reflection while Mass is held at Sagrada Familia every Sunday and on days of holy obligation. Mass is held at 9:00 in several languages. After leaving Sagrada Familia, walk across the road to the Park Plaça de Gaudí for a few moments of quiet contemplation. Enjoy a different perspective of the Basilica and permanently imprint the memory of your visit in your mind. No smoking, drinking or eating inside the basilica. No short skirts, plunging necklines or see-through clothing. Remove hats upon entrance and don't go with bare feet. If you are attending Sunday Mass, you will be required to remain seated during the service and no talking or photos are allowed while services are underway. Ideal time to visit: Much of the beauty of Sagrada Familia is in the architectural detail, not least of which are the stained-glass window mosaics. Mid-morning and sunset are the ideal times to appreciate the light streaming in through the many colourful skylights. Ideal day to visit: Unlike many Spanish tourist sites Sagrada Familia remains open on Monday's. Receiving fewer visitor's than any other day in the week, Monday's are the perfect day to avoid the crowds. 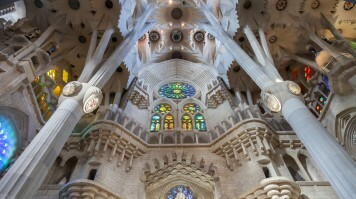 Interesting details: Gaudi was deeply religious and believed that no building should exceed God's work. The final height of Sagrada Familia when complete will be 170 meters, just a few meters shy of Montjuic, Barcelona's highest point. Sagrada Familia is a must-visit site, if not for religious reasons, then certainly to appreciate the architect's sheer genius. The basilica is steeped in mystery, meaning and symbolism with hundreds of interesting facts and little details which are often overlooked. A knowledgeable guide is a must if you wish to have these details laid bare in a way that makes Sagrada Familia come alive. We recommend booking a La Sagrada Familia tour, for both the convenience of a group visit and the benefit of having a well-informed guide.